Aloo Gobi Masala is an Indian vegetarian dish cooked with cauliflower, potatoes, capsicum and tomatoes and flavored with Indian spices. 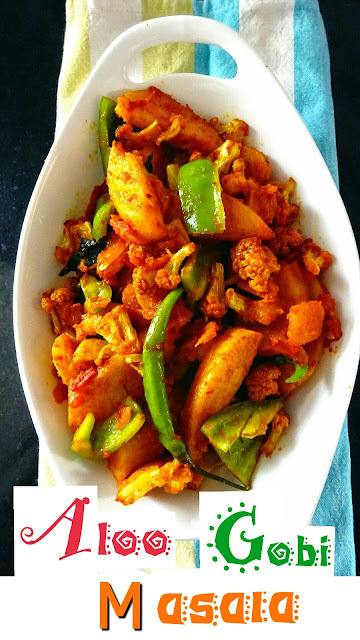 Aloo Gobi is also spelled as Alu Gobi, Aloo Gobhi or alu gawbi. Aloo Gobi Capsicum Masala is one of the most preferred vegetable in our house. 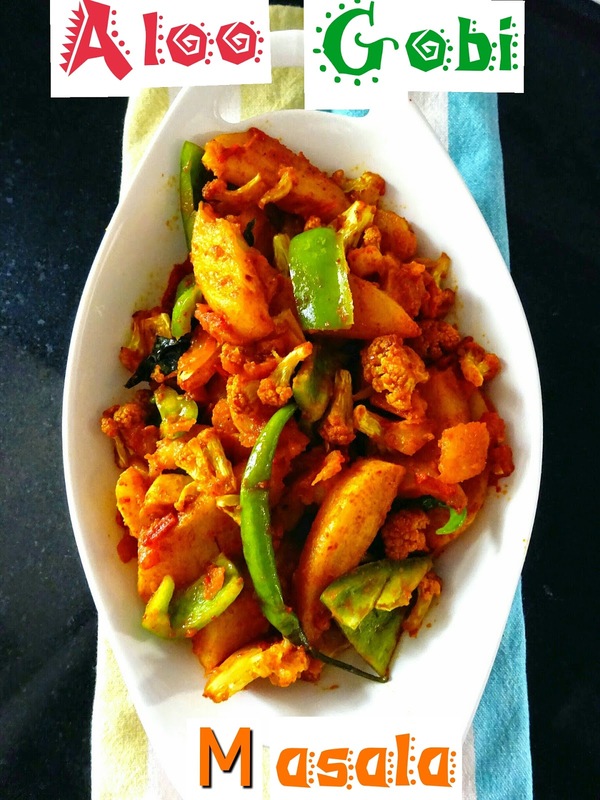 You can try this recipe with chappaties, or rice and dal. It’s very delicious! 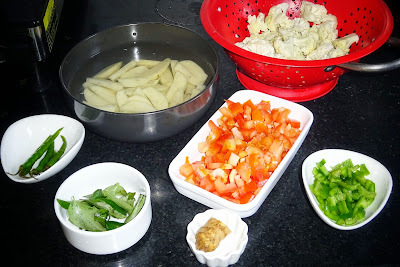 ◾Wash, peel and cut the potatoes in lengthwise in 1 inch thick slices. Keep them in water to avoid discoloration. ◾This step is actually very important to follow, the purpose of doing this is napkin absorbs moisture which results in comfortable and safe frying. ◾Now follow the same process with potatoes. Fry until crispy and light golden in color. This process requires approximately 5-7 minutes (on medium to high flame) When done, remove in plate, keep aside, and also remove oil from pan and leave 1 tsp oil. 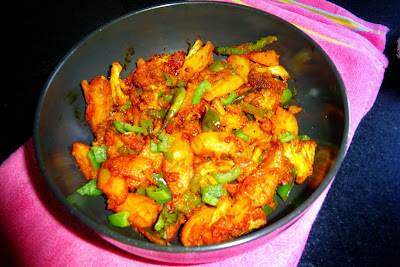 ◾Now take the same fry pan, where you left one tsp oil, in that add chopped tomatoes, curry leaves, ginger and green chilies. Mix well. Simmer covering lid for 2-3 minutes. ◾Now remove the lid, add the dry ingredients, that is coriander, turmeric, red chilly powder and salt to taste, Mix well, add 5-10 ml of water if needed, after adding dry ingredients as helps to mix well and avoid getting burnt. 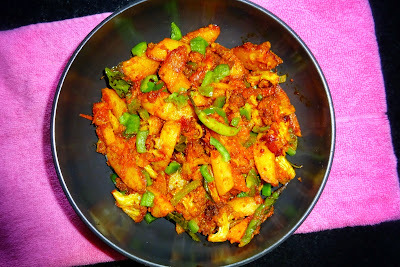 ◾Now in this add fried potatoes, cauliflower and capsicum, mix well. ◾cover the lid, and cook on slow flame for 4-5 minutes, till potatoes get properly cooked, when done, garnish with fresh cilantro leaves. Looks easy and very tasty.